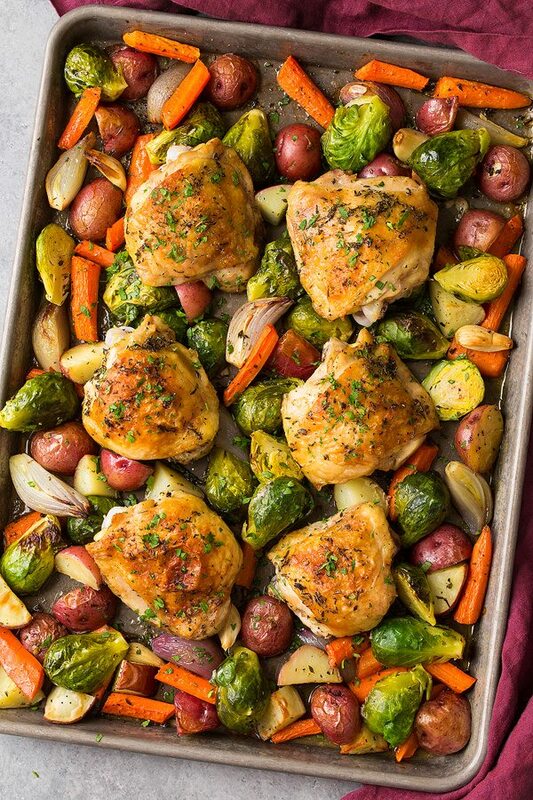 Aren’t sheet pan dinners just the best? 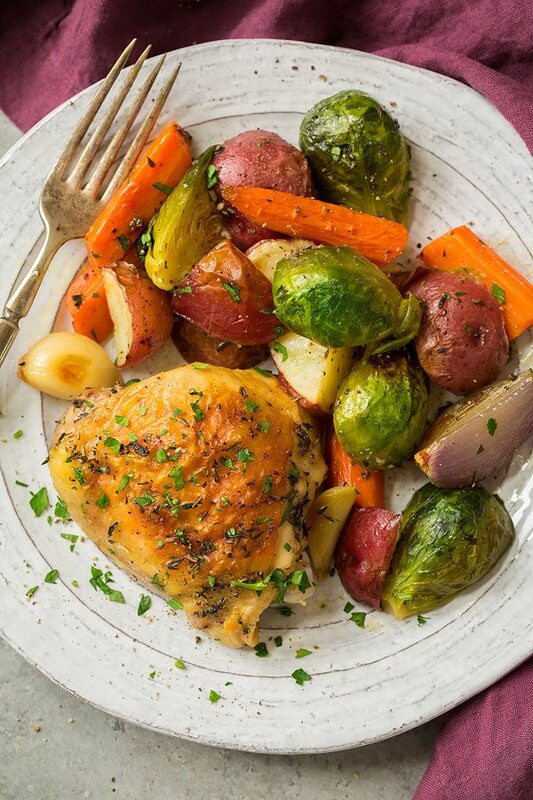 I love how convenient and easy they are and when they taste as good as this Roasted chicken with Root Vegetables does it makes me even more of a believer in one pan meals. 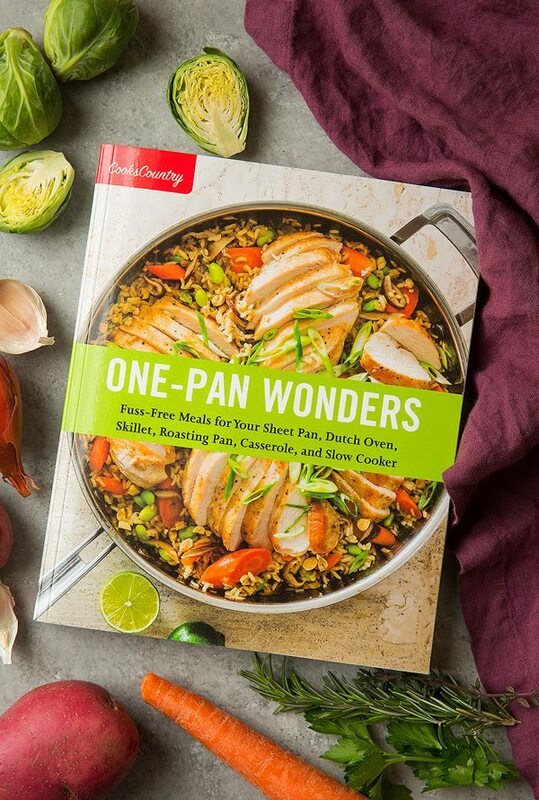 Cook’s Illustrated recently released their One Pan Wonders cookbook and I’m loving it. I asked them if I could share a second recipe from the book (last week I shared their Quinoa and Vegetable Stew, which I highly recommend you try btw). 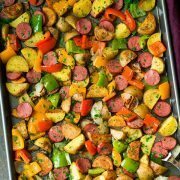 Easy One Pan Weeknight Dinner! 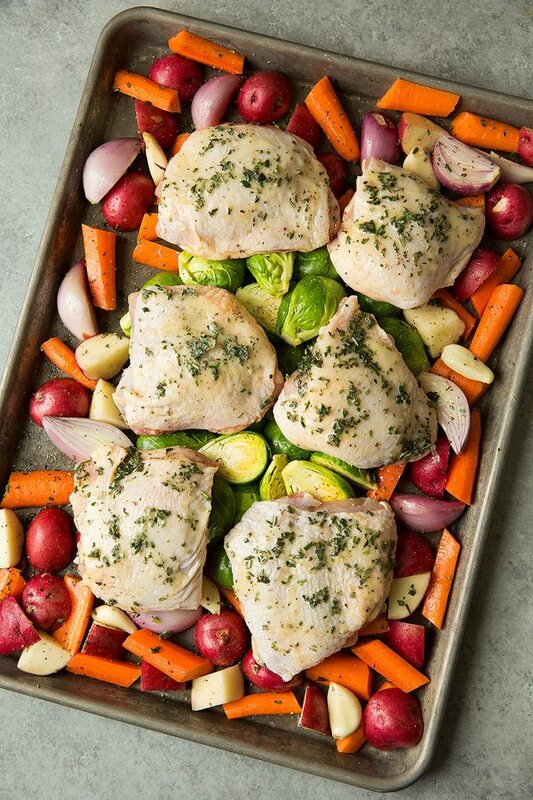 This sheet pan Roasted Chicken with Root Vegetables is destined to become a go-to weeknight meal and I just can’t get enough of it! 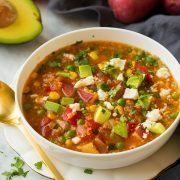 The flavors are so delicious and well balanced, plus this meal is breeze to throw together. And of course I really love the fact that it’s cooked in one pan. Cleaning dishes just ain’t my thang. I like their tip for roasting the Brussels sprouts in the center of the pan as it’s not as hot as the outer portions of the pan so they won’t be over-cooked by the time everything else is done. Note that I did spread them around a little after baking so you could see them better but I do recommend, as they listed, to cook them in the center of the pan. I also love the addition of butter in this recipe. I shared a similar recipe a couple of years ago but mine lacked butter. I also wanted to try their version because it has more savory vegetables whereas mine used sweet potatoes and apples (which don’t get me wrong I love that one too, but now I can rotate that recipe with this one). There are still so many more recipes I need to make from this cookbook and slowly but surely I’ll get there. I think next I’d like to try the Curried Chicken with Coconut Rice and Lime Yogurt Sauce. If you get the book let me know what you try and like! If you’d like to grab a copy for yourself you can buy it on Amazon. 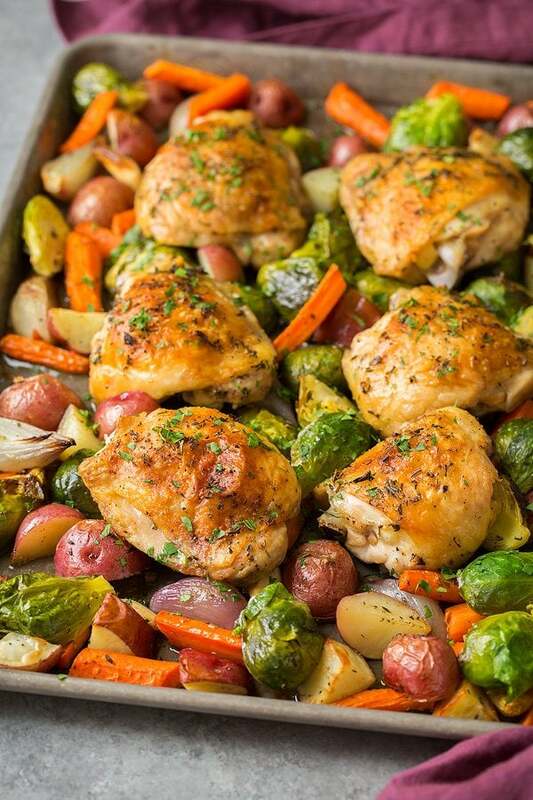 A convenient, simple, flavorful one pan meal with easy clean up! 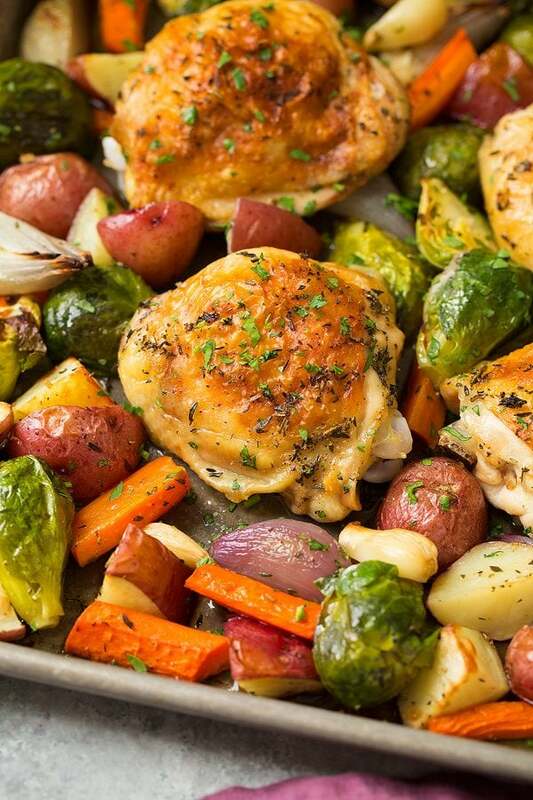 It includes tender, herb butter brushed chicken thighs and seasoned, roasted fresh vegetables. It's all cooked together and makes a perfect weeknight dinner! Adjust oven rack to upper-middle position and preheat oven to 475 degrees. 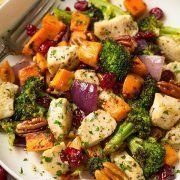 Toss Brussels sprouts, potatoes, shallots, carrots, garlic, oil, 2 tsp fresh thyme, 1 tsp fresh rosemary, sugar, 3/4 tsp salt, 1/4 tsp pepper together in a large mixing bowl. In a small mixing bowl stir together melted butter, remaining 2 tsp fresh thyme, remaining 1 tsp fresh rosemary, 1/4 tsp salt and 1/8 tsp pepper. Pat chicken dry with paper towels and season with salt and pepper. Place vegetables in a single layer on an 18 by 13-inch rimmed baking sheet, arranging Brussels sprouts in center. Place chicken, skin side up, on top of vegetables, arranging breasts pieces in center and thighs and drumsticks around perimeter of sheet (since I only used thighs I mostly just placed them over the Brussels sprouts). Brush chicken with herb butter. Roast until breasts register 165 degrees and drumsticks/thighs register 175 degrees, 35 - 40 minutes, rotating pan halfway through roasting. Remove sheet from oven, tent loosely with aluminum foil and let rest 5 minutes (I actually skipped this step). Transfer chicken to platter or plates. Toss vegetables with pan juices, season with salt and pepper to taste and transfer to platter or plates and serve warm (I also sprinkled on a little fresh parsley which is optional). Karen: This recipe is really tasty. My vegetables were a bit too well cooked. Even tho I followed the recipe some of my carrots and Brussels sprouts were mushy and it looked nothing like the photo. I used olive oil instead of vegetable oil and it worked fine. In the instructions it says to mix sugar with the spices although in the ingredients list there is no mention of sugar. 45 grams of fat seems like a lot for this recipe but it could be due to using vegetable oil and butter.